The right siding will bring out the full potential of your home's exterior. Investing in siding is more than just picking a color and hoping it lasts a while. The siding on your home is equally used for protection as well as aesthetic appeal. It is the external shell of your house; therefore, you want it to be properly maintained while providing an attractive appearance. The experts at Summit Roofing and Siding Contractors stock a collection of high quality vinyl and fiber cement siding and provide comprehensive installation with a long term warranty. We offer new siding installations in the exact color and design specifications you desire. Get the style and durability you've always wanted with the right siding company. 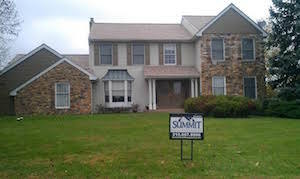 Summit Roofing and Siding Contractors' services are available all throughout Pennsylvania, including Chalfont, Lansdale, Doylestown and nearby. Click the button below to set up a free on-site estimate. This home was looking tired. Our client wanted to update the look of his home. He chose Certainteed Mainstreet vinyl siding and added a stacked stone facade up front for that added "pop." This homeowner was tired of repairing her old, damaged siding. She opted to replace using Certainteed Mainstreet vinyl siding. We also added a nice stone facade to make her home stand out from the rest. Choosing the right material depends on what you want your home's exterior to look like and the degree of maintenance each material needs. Some materials tend to be lower maintenance than others. Vinyl Siding - This is probably the most durable siding option for the cost. Vinyl can provide you with the look of real wood without the cost and maintenance. This type of siding delivers excellent performance without the upkeep that other materials need. Vinyl siding also won't peel, chip or rot and never needs to be re-painted. Fiber Cement Siding - This type of siding can emulate any style of siding, such as cedar shingles, wood and stucco, without any of the drawbacks. It is completely resistant against fire, wind, bugs and wood rot. Fiber cement is also extremely durable and there is little to no maintenance required. Wood Siding - Wood has been a classic siding material for many years. Wood possesses remarkable beauty, especially cedar. It can withstand harsh weather conditions and has the opportunity to last much longer than other materials. Steel Siding - Steel is an exceptionally strong material, almost completely resistant to harsh impacts. It also comes in a variety of colors and textures, including wood-grain. The most desirable characteristic of steel siding, however, is its impeccable fire resistance. Aluminum Siding - Completely resistant to fire damage with an enamel coating that can mimic other siding materials, aluminum siding is the perfect combination of strength and efficiency. Installation of new aluminum capping for all exposed wood – windows, doors, etc. Headquartered in Valley Forge, PA, CertainTeed is a leading North American manufacturer of building materials and specializes in the production of high quality roofing and other materials including vinyl siding, trim, fence, railing, decking, insulation, gypsum, and ceiling products. The ability to withstand high winds (certified up to 110 mph or higher) and a composition that resists heat, cold and moisture, certified vinyl siding retains its great looks over time. Vinyl siding never needs paint. Ever. The only maintenance it will need is a simple wash with a soft cloth and garden hose to keep it looking great. CertainTeed Vinyl Siding offers the best vinyl siding features and color options, along with exceptional durability and lasting beauty. - What’s the best way to prove a product will perform as promised? Independent testing. This is why the Vinyl Siding Institute (VSI) established the VSI Product Certification Program. Administered by Architectural Testing, Inc. of York, PA, the program allows manufacturers to certify with independent, third-party verification that their products meet or exceed the testing requirements specified in the industry standard for quality. -How many products have passed this Certification Program? There are nearly 825 products and nearly 325 colors on VSI’s Official List of Certified Products and Colors. In 2012, approximately 18 million squares of vinyl siding were manufactured in the United States. (A square equals 100 square feet of siding, or enough to cover a 10-foot x 10-foot area.) Another key test of quality is how long manufacturers are willing to warrant their products. Warranties offered by vinyl manufacturers typically last a lifetime and can be transferred to the next owner. Go with a siding contractor in Pennsylvania you can trust! All of these materials are available from Summit Roofing and Siding Contractors. Our professionals deliver quality craftsmanship for all siding jobs. Whether you need repairs or new siding installation, we are here to help. Our services are readily available in Levittown, Warminster, Feasterville Trevose, Abington, Bensalem, King of Prussia, Harleysville and nearby areas. Please call or contact us online for a free estimate!